Now you can grow your Essential Garden for bountiful harvest anywhere in the country. Chosen for varieties that will grow in all zones. 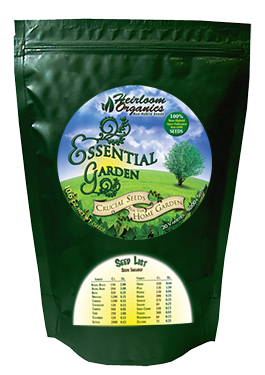 Each Pack has a total of 20 varieties of NON-HYBRID seeds and comes in a Mylar Pouch. * Each one was packed in a heavy cardboard box with indiscreet labeling. * Inside was the 2 bags of seeds, "Bag A" and "Bag B". Both bags contain the smaller bags of individual varieties. * Papers with charts on growing, in detail and displaying grow info on each variety in the vault as well as a seed list. * 2 rather large, nice quality desiccant packs wrapped and heat sealed in plastic for later use should you open the aforementioned bags to use. I thought that was a very nice addition and excellent forethought from a company thinking ahead. I believe this is a great start for a busy urban gardener who need a basic garden, for starts. I feel that it is easy to get this garden pack in the ground in a timely manner.